Add some zest to your life! For some reason best known by the Great Universal Intelligence, zest has appeared in my life. Repeatedly. Often. The kind of zest I’m talking about is hanging on trees! I’m always one to follow where my nose and taste buds lead me, for good or for bad. What kind of a friend would I be, not to share my journey with you? In January when we were in Sydney I saw Dukkha ‘with zest’ being sold in the markets and thought, why not try it myself? (my recipe from Sophie Grigson spells it Dukkha, but I notice most people spell it ‘Dukkah’, so whatever floats your boat). So I started drying my own zest and then adding it to my Dukkha–about two tsps Dukkha to one tsp dried zest. My technique, if you can call it that, is to use a Microplane. The zest is much finer and will dry more easily. 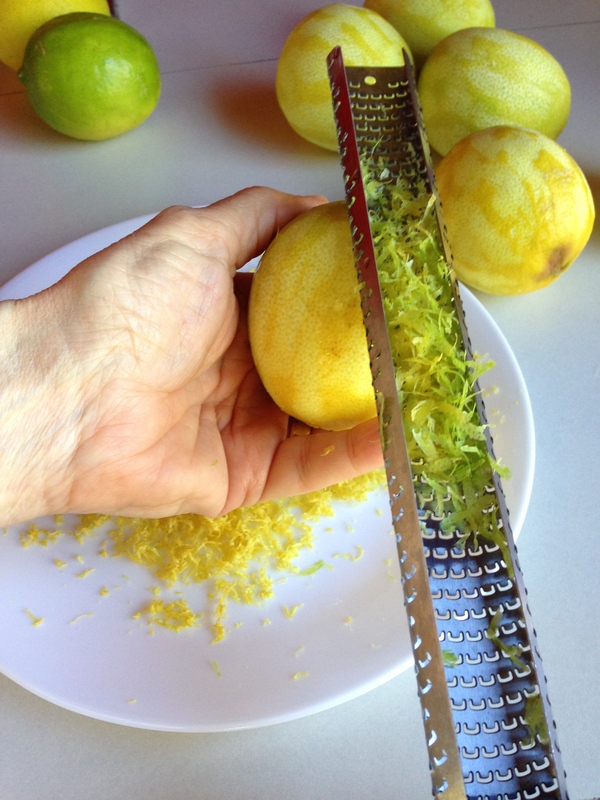 I use the narrow Microplane, and hold it so the underside is facing me, and I can see how much zest is accumulating. At the same time I can see how deeply on the skin I am grating. Don’t scrape too deeply because the white part is bitter. Because we live in a dry climate I simply spread it out on a plate and leave it for a a couple of days, and it is dry. If you live in a humid climate you may need to place it on a baking tray in a slow oven, then turn off the oven and leave it to dry overnight. 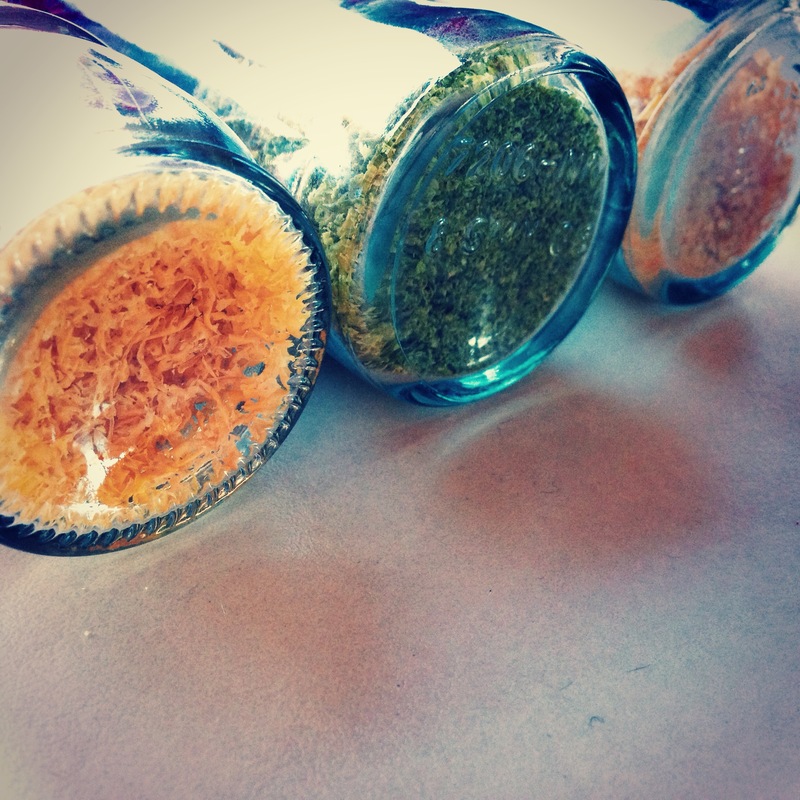 I recycle my little spice bottles and put the various flavours in each one. Do make certain the zest is very dry before bottling it, or it will go mouldy. 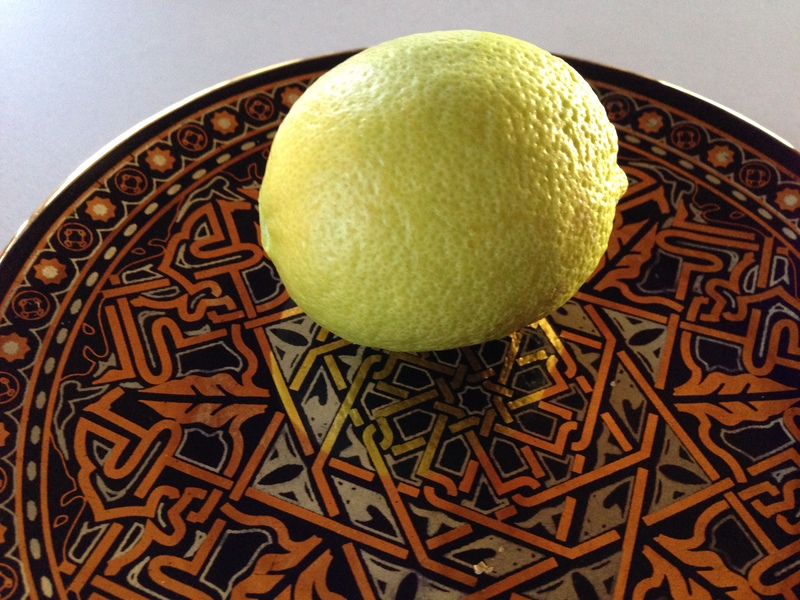 When the limes began to ripen at an alarming rate, I started zesting the outside and squeezing the juice and making ice blocks out of it for cooking, later in the year. I did talk about this in a previous kitchen post so I won’t labour the point. I make some blocks with zest and some without. 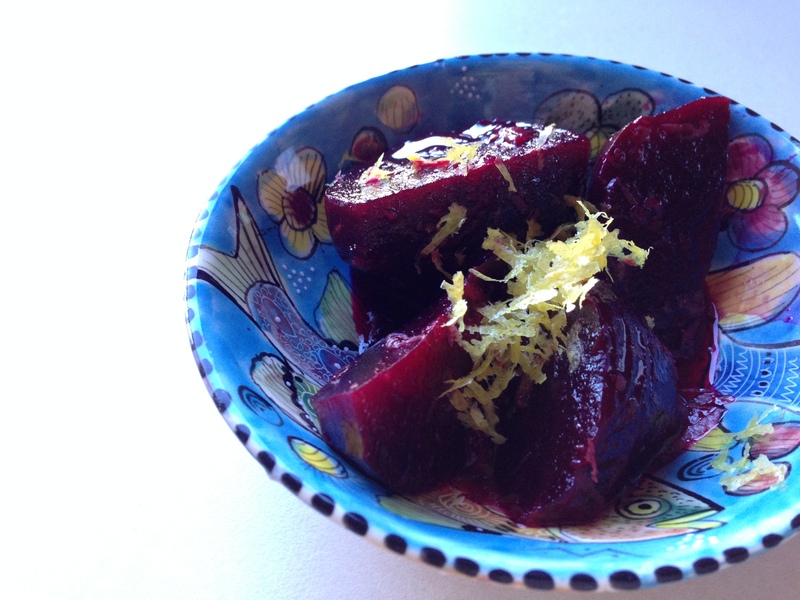 A week or so ago I saw a very simple idea to roast fresh beets, peel them, quarter them, and simply add the zest and juice from an orange. Let them marinate over night and voilà! Simple, tasty, zeeesty, yeah! 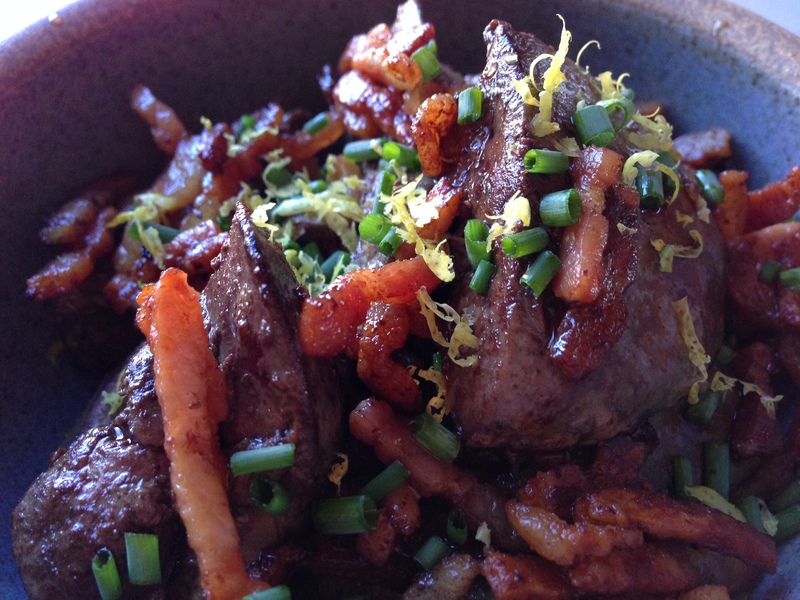 Chicken livers with bacon, zest and fresh chives. I’ve been known to ‘freelance’ my cooking here and there, ahem– just ask my family– they ask me all the time, ‘did you write it down so you can do it again? Usually no, but this time I took a photo! These chicken livers, sautéed with bacon, salt and pepper and topped with fresh chive and fresh zest were so simple, who needs more than a photo reminder? 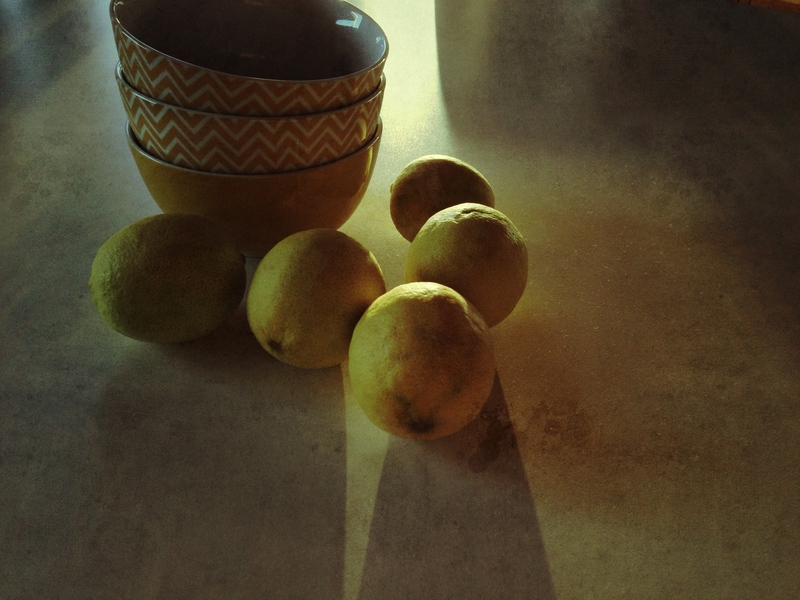 I don’t zest grapefruit, but I do love eating it… with a pinch of salt! My Mother ate it this way when I was young and our whole family likes it like this. Section the grapefruit, sprinkle a small amount of good quality salt around then let it sit for five or 10 minutes before consuming. 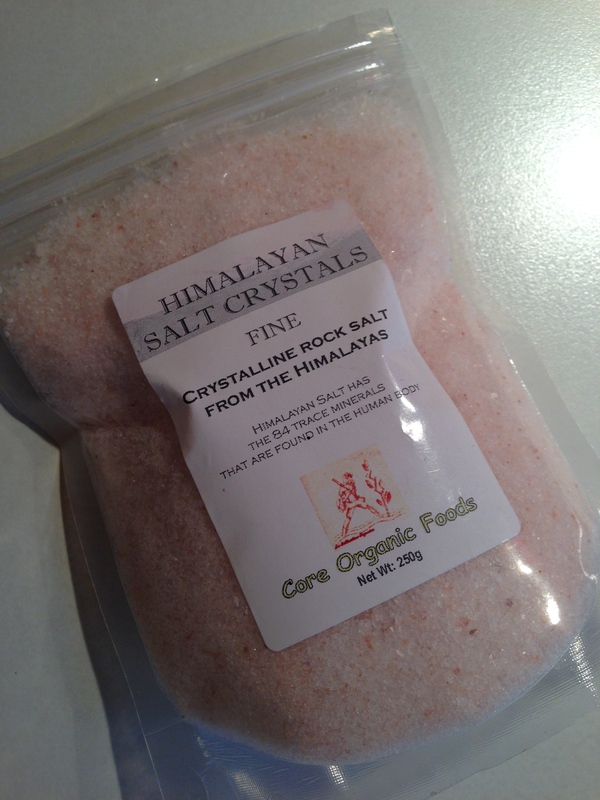 When you eat it, the salt seems to accentuate the sweetness of the grapefruit very nicely. I’m not saying it will convert you if you don’t like grapefruit or salt to begin with, but if you like to try simple things that are healthy and change up the tastes a bit, it’s worth a go. 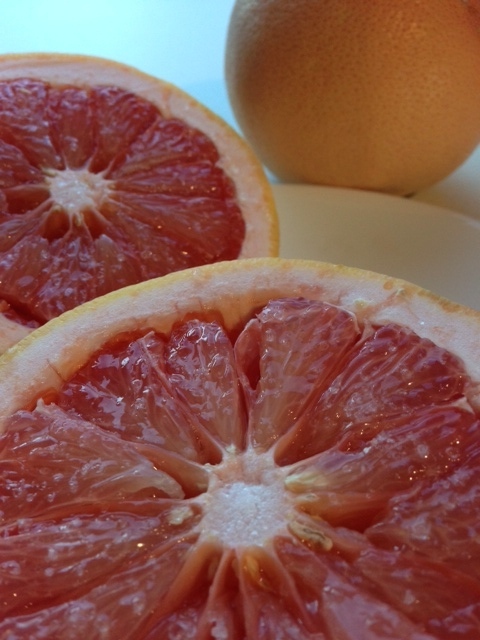 Our friends gave us these luscious pink grapefruit, how lucky are we? Here’s another recent bit of kitchen knowledge… Even though we don’t use pesticide on our citrus, we do sometimes pick it up off the ground when it drops, and use it. So it needs washing. A tip I recently saw is to keep a spray bottle of vinegar under the kitchen sink (which I always do anyway, for cleaning purposes) and use it to spray all vegetables before washing. Apparently it removes as much wax, pesticide and mould or other unwanted things, as antiseptic soap does. And why wouldn’t you want to use vinegar instead of soap?? Some people scrub their veggies, and that is fine, but with more delicate fruits, that doesn’t work so well. Rub the vinegar around as if you are washing the fruit, or not, with more delicate fruits. Rinse and presto! It doesn’t affect the taste at all.